...I pull my hair out. I spend good money putting fertilizer on it, reading how-to, and when-to books about it. I even dream about it...yeah, nightmares. You remember Jack in the Beanstalk right? Well, in my dreams it's not a bean plant...it's a giant weed. It's not a goose...it's a big can of Round-up. So it was my lucky day when I took my 5-year old son out to the practice field behind the local High School with his wedge and a couple golf balls in tow. "Now hit down at the ball." I'd say, as he whacked a few good ones over my head. The more he hit, the more I saw an explosion of dust from whence the ball did lay. ...The light bulb went off. "Come on Son, time to go home." ...as I gathered his belongings frantically trying to remember where I had stashed those plastic practice balls at the house. 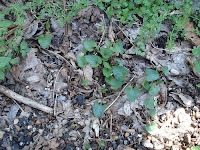 Now, my backyard is Zoysia...so it is just starting dormancy...except for the violets...the most hearty of weed. I took my son out to the backyard, laid a plastic golf ball on top of a weed and told him to hit down on the ball. HA! Dust did not fly...just a big green mass of weed! The violet had met a violent end. Thanks for saying hello. And as far as Zoysia is concerned...I played on a course in Virginia with Zoysia fairways, and I loved it. The ball always seems to sit up just a little bit more than anywhere else. Felt like I could wack the hell out of the ball. I think letting your son go crazy with a wedge on those weeds is a great idea. Your son isn't named Carl by any chance? "It's a Cinderella story ..."